13 December 2018 | KATOWICE | Poland | The World Bank made headlines around the world at the start of global climate talks here (COP24), when it pledged to invest $200 billion between 2021 and 2025 in countries grappling with climate change. This week, the International Development Finance Club (IDFC) went one better, announcing that its members – 24 development banks – had already provided that much finance in just one year, 2017, with the bulk of that coming from China, according to the 2018 IDFC Green Finance Mapping Report. The report showed that climate finance flowing through member banks has nearly doubled since the Paris Agreement was adopted in 2015 – from $100 billion in 2014 to $196 billion in 2017. Climate finance accounted for 89 percent of all green finance tracked in the report. The report tracks a total of $220 billion in green finance in 2017, of which $196 billion went to climate-related projects. 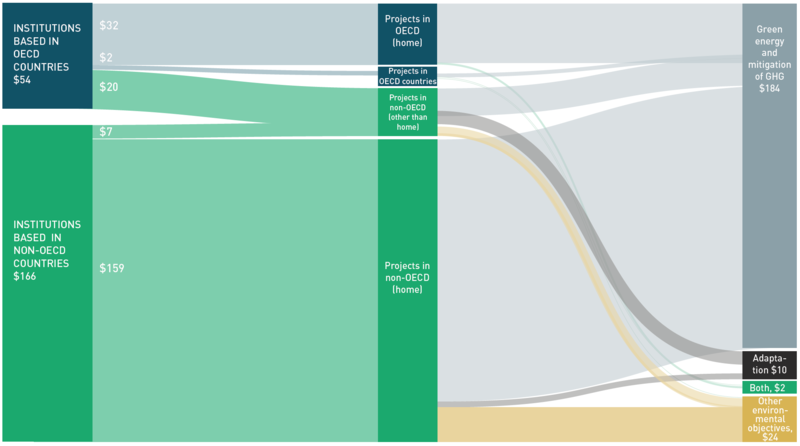 Of that climate component, $184 billion flowed into “mitigation” projects, which are designed to reduce greenhouse-gas emissions by promoting things like renewables-based power generation, low-carbon urban transport and improvement land management. Roughly $10 billion flowed into “adaptation” projects designed to help countries deal with the effects of climate change, and $2 billion flowed into projects designed to do both. IDFC is mainly composed of development banks from the South, and they have consciously structured their interventions around the Sustainable Development Goals (SDGs). The China Development Bank (CDB), which is seven time the size of the World Bank, comprised the bulk of the finance tracked – a staggering $155.3 billion total green finance in 2017. The numbers were calculated using Common Principles for Climate Mitigation and Adaptation Finance Tracking that were initiated in 2015 by the Multilateral Development Banks (MDBs) and IDFC, and the data was then verified by the Climate Policy Institute (CPI). The post Development Banks Provided $196 Billion Of Climate Finance In 2017 appeared first on Ecosystem Marketplace.